< E4412A > > > - > - fast speed, E4416A can be read 400 times per second. < E4412A > > - excellent Bobbi can reduce the uncertainty of the mismatch. 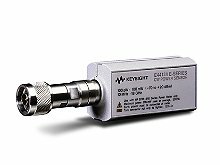 E4412A CW >E4412A dB diode power sensor is capable of measuring the average power within the power range of 10 MHz to 18 GHz frequency range < E4412A > and -70 to dBm (90 +20) power range.